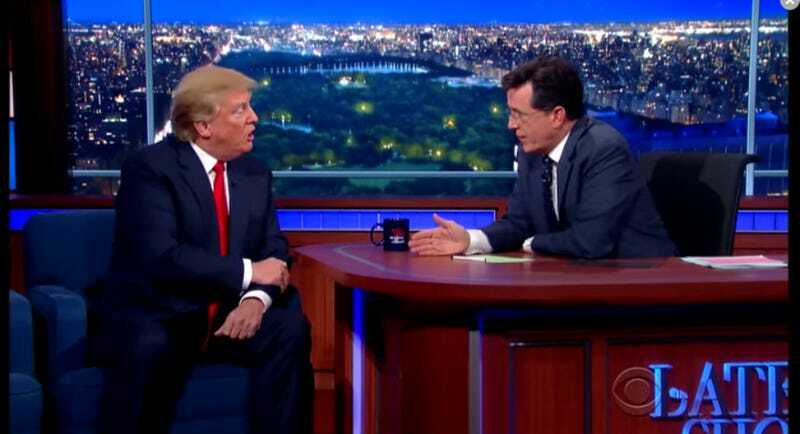 Brand new Late Show host Stephen Colbert hosted Donald Trump last night, the presidential candidate America richly deserves. His ideas continue to be highly sophisticated: Build a “great, beautiful” wall between the U.S. and Mexico with a “beautiful big, fat door” in it. Make Mexico pay for it. Make it a “serious wall.” We’re really getting somewhere. In a handbasket. Colbert started off by gently apologizing for having made fun of Trump for the better part of a decade. He then asked if Trump had anyone he might need to say sorry to, but Trump couldn’t quite think of anyone. It’s only too bad Colbert didn’t find time to ask Trump detailed questions about his very favorite book, the Bible.